Blind San Francisco bluesman Paul Pena penned "Jet Airliner", which Steve Miller re-jiggered for a huge hit. The royalties from that alone probably kept Pena alive for years longer than his fragile constitution might otherwise have been able to hold out. He finally achieved long-overdue recognition as an artist in 1999 with the release of Genghis Blues , a fascinating documentary relating how Paul was introduced to the exotic Tuvan throat-singing technique in the wake of his wife's death, and improbably, learned it almost instantly as a vehicle for expressing his grief. He mastered it so completely that he traveled halfway around the world to Tuva itself -- no small feat in itself for an ill and disabled man -- and went on to win an international competition. If you haven't seen the film, you must if you care about music. The soundtrack album is great too, featuring Paul melding his newfound throat-singing chops with his natural, acoustic blues-rock style, with plainspoken, personal lyrics just like "Airliner"'s. Once Pena had some buzz upon the film's release, his never-released album New Train was issued in 2000, and was a revelation. The album was produced by Steve Miller Band member Ben Sidran -- who turned Miller on to Pena's tune; the contrast between Pena's organic original and Miller's juggernaut is fascinating -- and features guest spots from Jerry Garcia and Merl Saunders. Pena's soulful songwriting, singing, and picking cast a spell here. It's simply a classic '70s album, reminiscent of nothing so much as Van Morrison's Moondance. Get it and impress your friends. 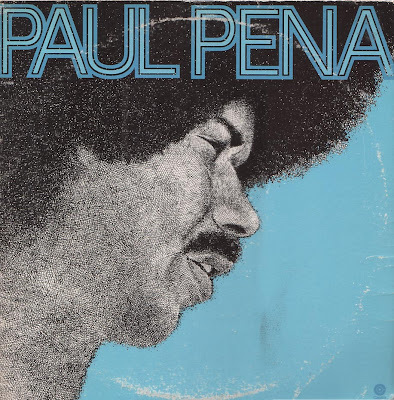 Far more obscure is Pena's self-titled first album, released by Capitol in 1972, which is long out of print and has never been reissued on CD or LP. It's not quite the masterpiece that is New Train, but it satisfyingly introduces Pena's gifts of straightforward folk-blues songwriting and soulful vocals. This album's hard to find online. I'm frankly not sure where I got this 250Kbps rip of it; if you recognize it as yours, thank you VERY much, and please credit yourself in the comments! On this terrific post from a blog called Music Maven, the album's tracks stream individually, along with New Train and Genghis Blues tracks and video clips. While it once had a home on the great Time Has Told Me blog, it seems to be currently unavailable for download anywhere on the web, so The Rare Stuff it is! Enjoy, and remember, comments, clicks, Amazon purchases through the above links, or donations are always appreciated. Paul Pena passed away in 2005. I had the wonderful opportunity to meet him a few years prior to that, and he was a remarkably gentle soul in a remarkably fragile body. He was no monk though, and his other senses were sharp indeed -- he grabbed my lovely young then-girlfriend and pulled her in for a very snug hug before she knew what hit her! Rest in peace, Paul, and I'm glad to help share your music. Wow! Much thanks for alerting me to this great artist! I had never heard of Pena, but this is great stuff. I definitely will get New Train. It's such a waste and shame that his story is so tragic, and that he did not have the chance to create more music and receive fame and appreciation from the masses during his lifetime. Yes, I fully agree BB... and yet, how joyous that before his life was over, he finally did achieve a taste of that fame and recognition. Many underappreciated artists are not so lucky. And how fortunate that he did, through no intent of his own, end up writing one of the signature hits of the '70s and getting life-long income from it! Definitely get New Train -- and definitely see Genghis Blues! It's very inspiring if depressing at times. I hope that many people "discover" Paul Pena. I love New Train, but the first CD holds a special place in my heart. I listen to it feeling that I have a special part of the world that few people know of. While I'd like to keep that special music to myself, it's important for people to hear just how talented Paul was. Susan Tedeschi and others have immortalized "Gonna Move", but there are so many others that REAL musicians should embrace and cover. Peeps, if you like Pena, BUY the CD. His family gets the royalties. Thanks for your comment, Maven. However I want to clarify that there is NO, nor has there ever been, CD release of this, Pena's first LP. If there were one in current release, especially one that was benefiting Pena's family, I would certainly not have made it available here for free. There IS a link to purchase New Train from Amazon in the text of the original post for that very purpose. Sorry, PC, I was talking about New Train. I, like you, posted the original CD tracks so that people can understand the depths of Pena's talent. Love your stuff here and have marked it as a favorite. Keep the music alive! Just heard his original "Jet Airliner" and immediately had to get my hands on everything else. I was VERY sad to learn there wasn't much. Thank you so much for posting his debut album here. Would love to own the vinyl at some point but was dying to hear it NOW. I have purchased the New Train CD and look forward sharing it with people. A truly special talent that most of the world will never know. A damn shame. I had the pleasure of hearing Paul's music live very early in his career as I went to the same college (Clark University, Worcester, MA)that Paul attended for a while in the late 60s. He stuck around the college area for a while after leaving, and played often in small campus venues. An outstandingly talented songwriter and musician as well as a really decent human being. Still have my original copy of the first album, though the no currently operational turntable to play it - got to get one of those vinyl to CD or MP3 converters. Seeing him in Genghis Blues made me think back to those wonderful days. Thanks for this post. What a Voice. Just amazing. Thank you for this one. Looking very much forward to listening to this. Thanks for the tip. I've been looking for a copy of this for a few years, thank you very much!!! Genghis Blues - it shows a good bit of Paul's personality and his story, as well as some fascinating music. You might also want to check out the live CD Paul Pena recorded with the artist known as "Big Bones"
I'm the source of your rip if you got it from Time Has Told Me. I've also posted most of the tracks on youtube now, plus his appearance on Conan while he did a short tour in 2001 to promote New Train. Thanks for keeping the rip available and spreading the word about Paul. Thanks a bunch, Fink, glad you found your way here and it's my pleasure to host the album here -- I hope it helps in some small way toward an eventual reissue, and meanwhile, to get people to go buy New Train. Gotta go check out that Conan vid now! Wow, this is just as nice if not better than his 2nd release. Thanks for getting it out there for all of us to hear!!!!! Thanks a lot, friend. This is an amazing artist. It is a shame that I knew nothing of Paul Pena. I have his New Train album. It is a gem in the truest sense. Got to hear this one! This is the best site I came across for this album.